Whether it's for storing leftovers in the fridge or packing a picnic, these folding food boxes are just the job. They flatten down when not in use to take up minimal space. When in use they are generously proportioned. They are made of silicone and have a plastic clip-down lid. So if your're out for the day, there's no risk of your lid coming off and your lunch roaming free in your rucksack so no mess to clear up afterwards. The lids are embossed with the Isabella logo name and the boxes come in varying shades of grey. There are 3 boxes in the set, the smallest being 10 x 10 x 3cm, medium 14 x14 x 3.5 cm and large 19.5 x 19.5 x 3.8cm. 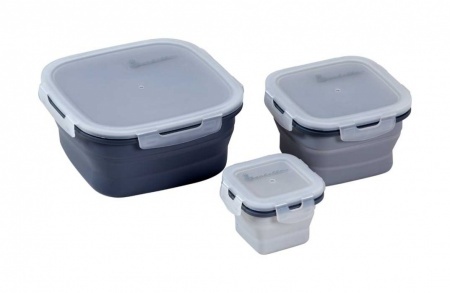 Sizes: 10 x 10 x 3cm, 14 x14 x 3.5 cm and 19.5 x 19.5 x 3.8cm. Storage: Collapsible for easy storage.